In January this year we went back to northern Ghana with the express aim of getting the derelict clinic in the overseas area (across the Volta river) not only renovated but made in to fully functional clinic that would bring healing and hope to an otherwise forgotten group of 10,000 Ghanaians. When we left mid-February, we had appointed a local builder and organised both a team from the King’s Village and from the village where the clinic was to oversee the works. We left hoping that the work would continue in our absence and that the rains would not come early! We were updated regularly, which was a great source of encouragement. 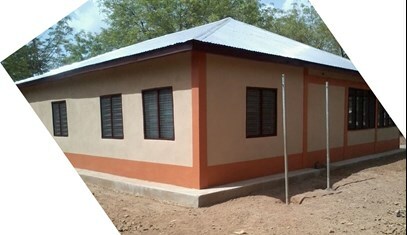 Finally at the end of March the pictures of the finished clinic were sent across to us. The aim is to send nurses and other medical workers from the existing King’s Medical Centre to work in the clinic for a month at a time. We are just so thrilled that during the rainy season the locals will no longer have to take their sick ones into their huts and watch them die. The Nutrition Centre, at the King’s Village, continues to rehabilitate so many severely malnourished children. Once the children and their mothers have been sent back to their home the Nutrition Officer visits them to monitor their progress. He has been delighted to see that many of the 1000 children saved are thriving and in a lot of cases attending the local village schools. When we look back over the last 7 years and see the incredible progress that has been achieved we are just overwhelmed. Thank you to every single person that has supported us on this journey.